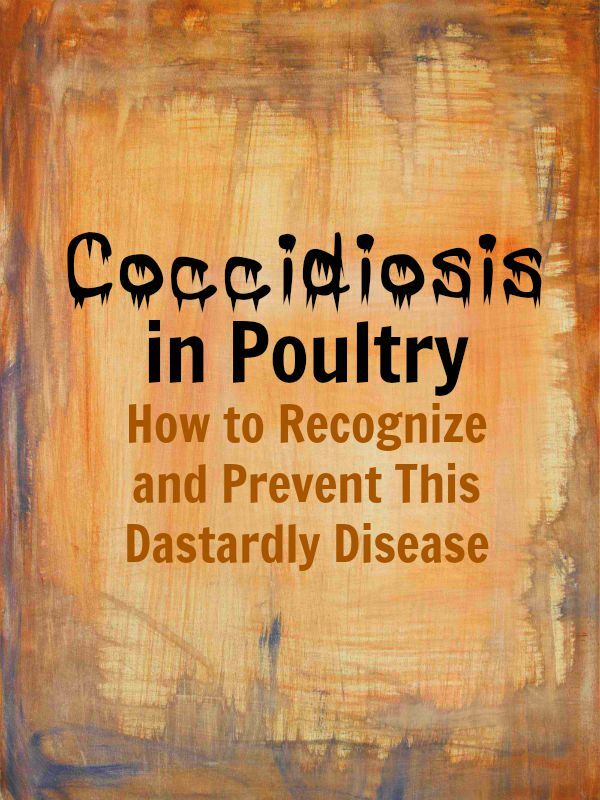 In over 30 years of chicken keeping, I’ve never had to deal with the dreaded coccidiosis in poultry. When it hit my peaceful poultry yard, I was unprepared. The rapid spreading of coccidiosis in poultry is shocking. I was reeling from the voracity of this viscous killer. My desire is to share what I learned with you to prevent your being caught with your pants down like I was. The first thing I noticed was a decrease in activity and appetite. My turkey poults seemed to be experiencing more than my Speckled Sussex chicks. They were fluffing their feathers out as if they were hot. I had not observed any other symptoms. I went out to do chores a couple of mornings later and found a turkey poult dead. In a flash, I began to run all conceivable culprits through my head. Another of the 6 remaining poults was very still and had its head and neck craned back between the shoulder blades. It was panting heavily. Again, my thought was the heat is the culprit. We had been experiencing 100° plus temperatures with 50% or higher humidity for at least 3 weeks. I had enough knowledge to recognize that foamy, bloody poop means the deadly disease, coccidiosis. The race was on. I checked my copy of Carla Emery’s Encyclopedia of Country Living, as always, and read what she had to say. Then I checked with my chicken keeping friends whom I knew had dealt with this before. Coccidiosis is intestinal disease caused by a microscopic parasite called coccidia. It’s present in every chicken yard. It’s not just a problem for poultry. Coccidiosis effects all farm animals as. Timber Creek Farm has a helpful article on coccidiosis in small homestead ruminants. However, it’s the main cause of death in chicks. Many times the secondary health problems caused from the cocci infection will kill the chick especially dehydration. Cocci love warm moist conditions. For hot and humid areas, like ours, the summertime is the perfect storm for this parasite. This year the conditions were prime. We had flooding from early winter until the first week of July. Then it went straight hot. I mean 105 for days on end, not counting the heat index. The mode of transmission is through the poop of infested animals. The simplest explanation is the eggs of the parasite, called oocysts, live in poop. As the chicks scratch and peck, they ingest the eggs and are contaminated. Exposure to cocci can’t be prevented. Chicks between newborn and eight weeks are easily overwhelmed by the parasite. Chicks who are brooded by their mom hardly ever have a problem with coccidiosis. As they are exposed to her poop gradually, they build a natural immunity to it. Motherless chicks who are placed into any area where adult birds have been housed are at greatest risk. They haven’t been giving the opportunity to build any immunity. I believe this is why we’ve never experienced the disease. We very seldom acquire birds except from our own hens hatching. Although I have ordered chicks in the past, I think the extreme weather conditions created the breeding ground for coccidiosis. As I’ve learned, turkeys are far more fragile than chicks. They require much more “mothering” and gradual environmental changes. 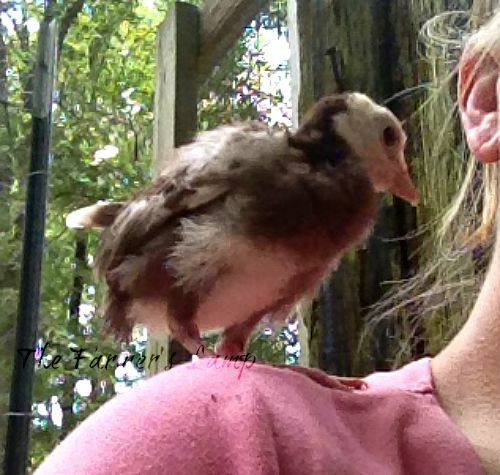 We lost no Speckled Sussex chicks to coccidiosis! They are my favorite breed for many reasons, but their hardy health is one of the things I like best. It’s not our practice to use chemicals or medications for ourselves or our livestock. We prefer to use holistic health management for. In this situation, I felt I had let my flock down. I had taken the time to prepare my knowledge or their holistic first aid kit. It would take time to acquire the herbs and essential oils I need and for them to take affect. I didn’t have this time so I purchased Sulmet from my local farm supply store. I followed the directions for adding medication to the water. I did this for both the Speckled Sussex chicks and the turkey poults. I was optimistically cautious because there had been one bloody poop in the Sussex yard. On the first day of treatment, everyone drank the medication. On the second day, they drank some. By the third day, everyone refused to drink from the medicated water. The outside temps were just too hot to let them go without water. This meant a change in tactics was needed. Another of the turkeys had died so, on the advice of a vet, each turkey was caught and medicated. Using a dropper, they each received a straight dose. The next morning, another one was dead. Again that evening, I medicated them. The next morning all four were alive. I was hopeful. For two more days they received the medication. I began to see only slightly pink and less frothy stool. I was encouraged that we had beaten it. When all four of the remaining turkeys went to bed and sang their good night song, I was even more encouraged. The next morning I found the dead hen. I was devastated. It was about more than the $215 investment in the turkeys. There was the feed, the medication, the time and energy and mostly the emotional investment. While all of this was happening, I was researching and talking to fellow chicken keepers as much as possible. I am aware that many people do not like Sulmet. They are especially against giving it undiluted. A veterinarian gave instructions to do it this way since they would not drink the medicated water. The dropper application is a last resort. The dose is minute. If they were going to die, it would not be because I had not done all I knew to do. Based on what I had learned, the remaining turkeys were removed them from their brooding yard. I put them in a rooster yard which had been vacant for almost a year. Nothing was taken from the infested yard except the tarp that was covering it, their waterer and feeder. I disinfected both of them with hot water then hydrogen peroxide. I had learned that any wooden surface can hold the coccidia and let it thrive. I sprinkled DE over everything in the infested yard and their new yard. They were given new roosts. Their food and water was elevated on uncontaminated wooded blocks. We started giving them apple cider vinegar water, 2 tablespoons to 1 gallon, again. I did this for the Sussex chicks as well. There are well known chicken keepers who oppose the use of diatomaceous earth. I understand their points and respect them, but simply don’t agree. We’ve used it on our farm for many years for all kinds of purposes. We believe moderation is key in all things. 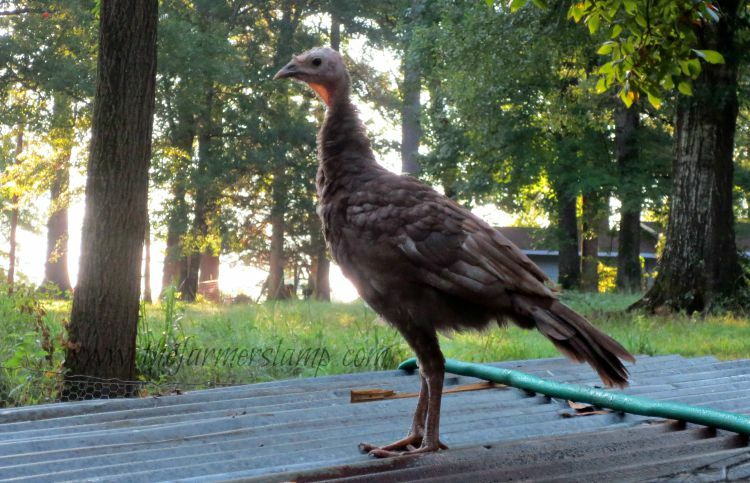 On the day I write this post, the two remaining turkeys, Crazy Cora and Cocoa Roo, are now 12 weeks old! 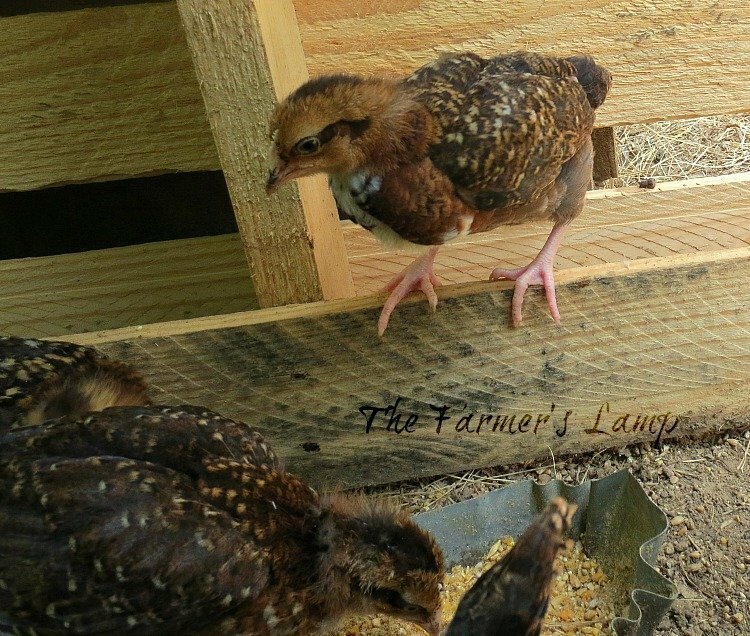 They are living in the grow out yard and have a “turkey tower” which they share with their friends, the Speckled Sussex chicks. They have normal healthy poop, as any Ma can appreciate. They are growing fast and endearing themselves too us daily. Prevention is the most important thing. Being prepared will do away with all the worry and need for treatment. The biggest thing I did wrong was to put the poults into a recently used breeder yard. Scruffy had hatched and grew out her brood just a few weeks earlier. Our brooder houses are made of wood and set on a concrete base for elevation. This yard is on the low side of our chicken compound and had flooded several times this year. This set the perfect environment for the coccidiosis parasites to grow. Once your chicks have been infected, they may always have compromised intestinal immunity issues. Lethargy and loss of appetite may be your first clue. These are kind of generic though. Another first sign will be foamy stool. You may notice the birds fluffing up their feathers as if they’re hot. They will also appear inactive, unresponsive, and droopy. The reality of this intrepid intruder in your flock is they may appear perfectly normal and healthy up until death. Coccidiosis poop can have two different appearances or may exhibit both. It will be slimy and mucousy, with a frothy appearance. It may also appear pasty, white or yellow. 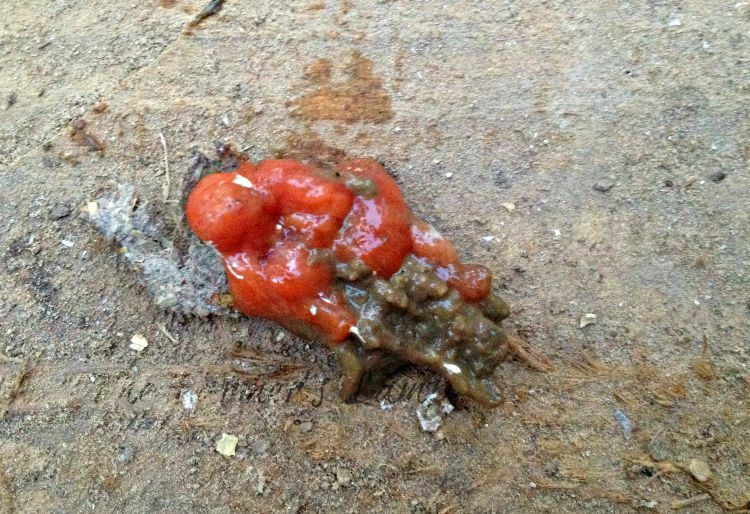 If you see bloody poop, you know for certain, it’s coccidiosis. Different strains of cocci can cause varying symptoms. But these symptoms are general to all strains. Someone told me an infected bird could be spotted before you see these signs. They’re smaller than those they hatched with; they will feel light as air; and have little breast meat. They also have a razor sharp keel bone. I can’t confirm this with my own experience. I wasn’t looking for these signs. Since some coccidiosis symptoms mimic vitamin and mineral deficiencies it can be hard for some people to identify. 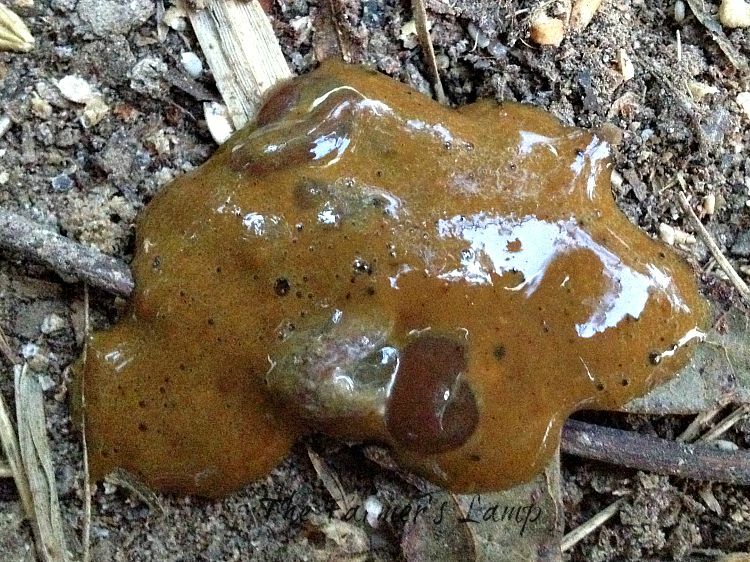 You could always call a vet to examine their poop. In the haste caused by my unpreparedness, I purchased Sulmet to stop the killing. I highly recommend natural treatments and in the future will be prepared just in case. I don’t want anyone else to go through. But if you are not averse to chemical medications for your animals, it is a an option. Offer apple cider vinegar water to chicks from day one – 2 tablespoons to 1 gallon of water. Ensure the chicks don’t get chilled. If you have them under a brooder light, be sure they’re not too hot. A weak bird may not be able to move when it gets too hot. To my knowledge, there are only two medications available for treating coccidiosis. Your local farm supply store will carry these. They are Sulmet and Corid. The dying was stopped and healing begun. Now I devoted my energies to learning how to holistically and naturally prevent and deal with coccidiosis. Lisa at Fresh Eggs Daily is the go to person for keeping your poultry naturally. Her article on coccidiosis would’ve told me everything I needed to know about natural treatment and prevention. With her permission, I’m sharing this link with you. My desire for you is that by following the preventative measures shared, you will never have to face this devastating disease. My complete sympathy and understanding lies with those whose hearts are gripped with fear at the mention of “coccidiosis”. Should you come face to face with the arch nemesis of every chicken keeper, you will have the resources you need to neutralize the threat. If you enjoyed this article please share it with your family and friends. Have you dealt with destroyer in your flock? Comment below to share your story and lessons with us. Great tip! Thanks for sharing, much appreciated.